A campfire burns at Woods Canyon Lake Recreation Area campground site off Forest Road 300. Family fishing and camping during summers in Arizona can produce some of the best memories life can spawn. What makes for good camping and fishing during triple-digit months of desert sweat? Escaping to the high country for a ton of stocked or self-sustaining fish, quality camping amenities, and scenery that’s as cool as the air temps. 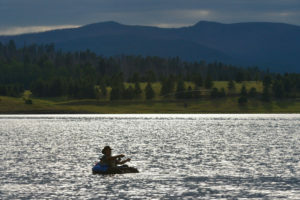 OK, here is our top-5 list of family camping and fishing spots. Do you agree? 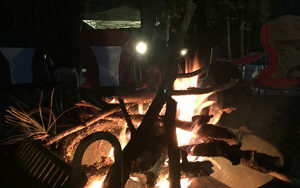 This family-friendly camping area is a few miles from Williams and an hour’s drive from the Grand Canyon to the north. We recently had a report of excellent fishing with anglers catching trout and crappie on small jigs and lures. PowerBait fished on the bottom also has been working. Catfish are being caught on nightcrawlers and prepared catfish baits. More than 40,000 trout have been stocked in the lake this year. Directions: From Flagstaff, take I-40 west to Exit 165; turn north onto AZ 64 and go about 2 miles to the campground entrance on your left. Paved and all-weather gravel roads are suitable for passenger cars (but in winter may be closed at times because of snow). See a Google map. An excellent fishery for getting the family into the outdoors and onto sunfish and mudbugs (crawdads). Has excellent family-fishing amenities such as clean and spacious campgrounds, picnic areas and fishing piers. Kids can catch sunfish off piers and over rocky shoreline areas using No. 12 hooks and small pieces of worms. Crayfish can be trapped here as well. See a video on how to catch both. Directions: Fool Hollow Lake Recreation Area is located in east-central Arizona, two miles north of US 60 off Highway 260 in Show Low. See a Google map. Possibly the state’s premier walleye fishery. Has a year-round concession with 75 campsites (seven have electric hook-ups). New facility improvements, including a new fish cleaning station, restrooms, stairs from the upper parking lot down to the boat launch, and ADA boat trailer parking are now open. The lake and creek are great for putting the family on trout, sunfish and crayfish. 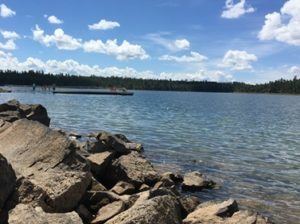 In addition to the premier walleye, the lake also has smallmouth and largemouth bass, channel catfish, and bluegill, and is stocked regularly through the summer with 12-inch rainbow trout. Kids can catch sunfish from the fishing piers or among the rocks along the dam with a small hook and piece of worm. Our spring surveys showed high populations of smallmouth bass in the lake, so throwing spinnerbaits or crayfish imitations could produce some nice fish. The meadows portion of Show Low Creek also is a great family fishing area for channel catfish that are being stocked. It’s easy to access and is excellent for kids — there’s even a disc golf course. Directions: From Show Low, take Show Low Road southeast one mile from Highway 260. See a Google map. 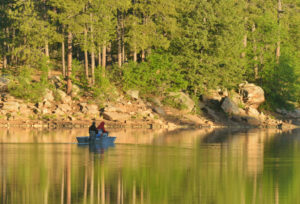 The best bet for anglers with boats or kayaks (the Woods Canyon Lake Store has boat and canoe/kayak rentals and necessary camping amenities) is to hit the water just before sunrise and troll, or slowly work, small in-line spinners 15 feet deep. Any deeper, and you’re typically fishing below the thermocline where during the summer there is no oxygen. Anglers could have no problems getting a six trout daily bag limit or hooking into a rod-rattling tiger trout. Directions: From Phoenix, take Highway 87 (Beeline Highway) northeast to Payson and then Highway 260 east to Forest Road 300 (Rim Road). Then turn north onto paved Forest Road 105 and proceed about a mile to the lake. 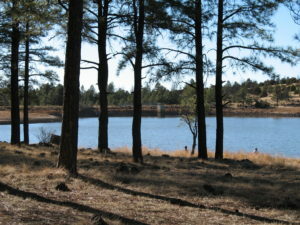 The lake is about 30 miles east of Payson. See a Google map. Cutthroats have been biting on and off, and there are plenty of rainbow trout along with lots of crayfish for kids if the trout are not biting. The best part may be the excellent and plentiful campground amenities. 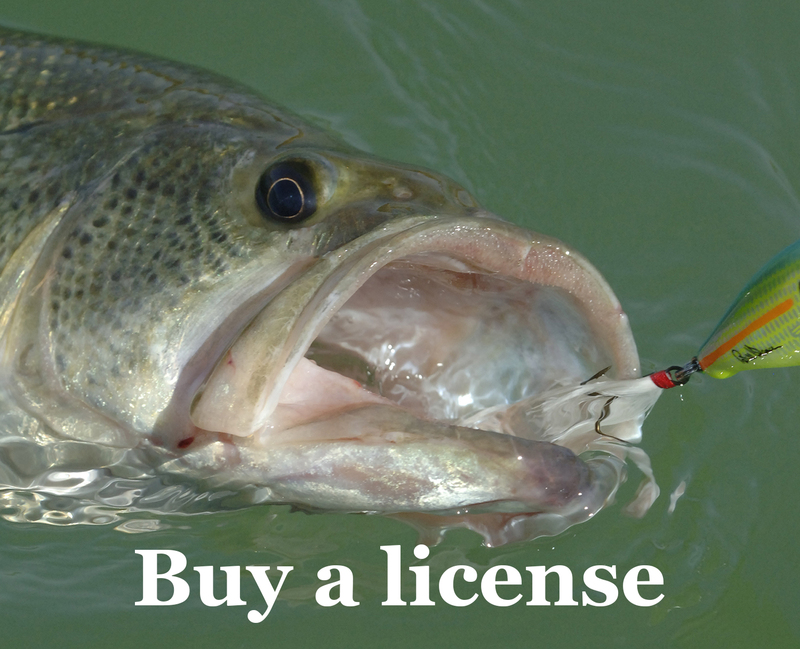 Shore-angling is still an option, but as the summer goes along, you might want a boat (rentals are available at the store) because most trout will be deep. 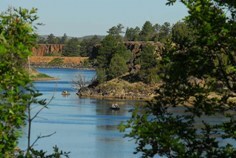 What’s your favorite AZ summer fishing & camping hole?